John Bull Tyres available at the Electric Garage Company. Homepage. This page: An illustrated invoice for the Electric Garage Company, a John Bull tyre retailer, plus a 1930s advertising blotter. 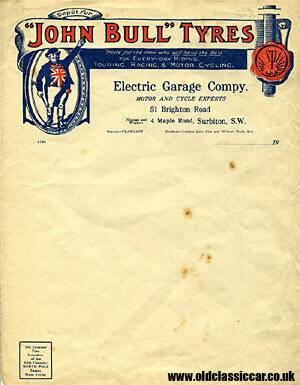 The blank invoice shown here was used by the Electric Garage Company - "Motor and Cycle Experts" - and had two locations, one at 51 Brighton Road, the other being at 4 Maple Road, Surbiton, S.W., the latter being the location of their garage and works. They were approved stockists of John Bull Tyres and other products. I'm sure this dates to the 1920s. At this time, many former cycle repair shops were switching to the maintenance and repair of the new fangled motor-car, which thanks to affordable models produced by both the larger manufacturers, such as Austin and Wolseley, and more obscure cyclecars and Light Cars from lesser-known makers, meant that the spread of motor-car ownership amongst the masses was in full swing. The motor-car was still very much in its infancy, and repairs were frequent. Tyres too received a real punishing on the many un-made roads of the day, requiring the services of firms such as the Electric Garage Company. "John Bull Tyres - Made for the man who will have the Best for Every-day Riding, Touring, Racing and Motor Cycling." The small box at the lower left corner mentions another of their tyre products: "The Greatest Tyre Invention of the 20th Century: NORTH POLE Patent Pram Tyres". 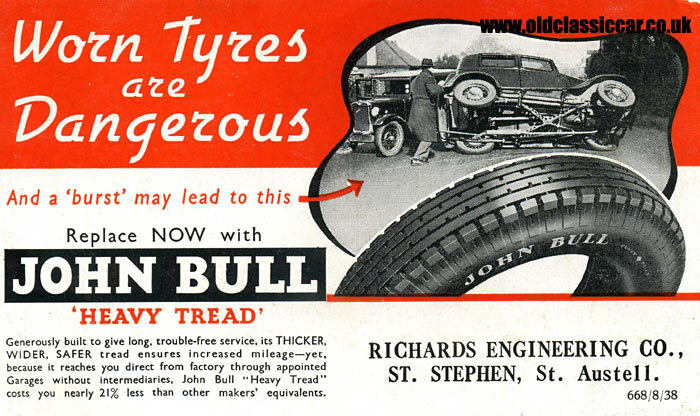 Seemingly, if it was rubber and related to motoring, John Bull were there with something to offer. Just one example of their diverse product range is the John Bull Bulb Carrier, a moulded rubber item from the 1920s, designed to safely store automobile bulbs, until such time as they were required. As more John Bull memorabilia comes to light, I'll add it in. Perhaps the most common John Bull related item to turn up nowadays, is the cyclist's puncture repair kit, one of which will be added to the site shortly. Again this is a piece of advertising memorabilia given out by an approved John Bull tyres retailer, probably in the 1930s. The agency this time was Richards Engineering Co., St. Stephen, St. Austell in Cornwall. It advocates regular tyre check-ups, stating "Worn Tyres are Dangerous". Judging by many of the cars shown in the vintage car photos section, significant numbers of pre-war motorists were quite happy to run around on bald or otherwise worn-out tyres. This blotter therefore was designed to remind people about the risks of using worn-out tyres, at a time when punctures were much more common than they are nowadays. A stark image, showing what could be an Austin 10 on its side, was used to illustrate their point, something that could have been avoided had the driver chosen John Bull "Heavy Tread" tyres for his or her car. Another tyre company blotter, this time for the India brand, can be found here, as can this one for Dunlop tyres.